Mars Hill University Athletic Director David Riggins announced he will retire in December at the end of the fall semester. 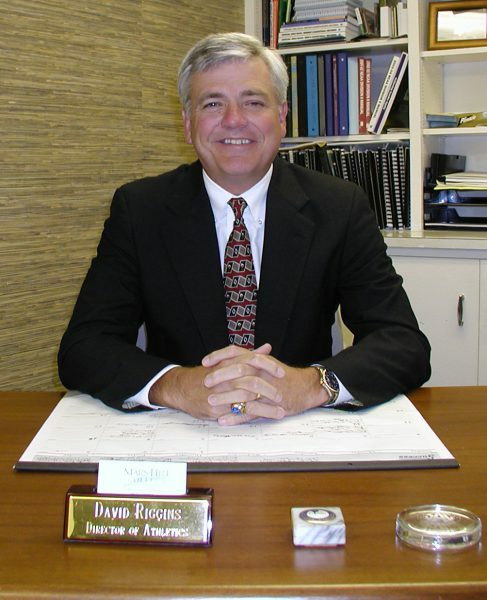 David Riggins has served Mars Hill for 32 years. He joined the school as head men’s basketball coach in 1986, added the title of assistant athletic director in 1993, and took the top athletics job in 1998. Riggins is the winningest head men’s basketball coach in school history. He ac­cumulated 431 victories as a head high school and collegiate coach, which together spanned 23 years. His high school teams collected eight conference championships and three state championships, while making nine playoff appearances. He guided his Mars Hill teams to three post-season appearances, including the 1994 South Atlantic Conference Championship title. He was named the SAC Coach of the Year in 1994. Riggins has been actively involved in NCAA committee work, having served as chair of the NCAA Championships Committee. He also served on the NCAA Legislative Committee, NCAA Budget and Finance Committee, and the NCAA Playing Rules Committee. Riggins served two years as vice chair of the NCAA Division II Management Council. He also served on the NCAA Division II game environments committee. That group initiated its work in July of 2007 with a summit held in Washington D.C. which Riggins chaired. He also chaired the NCAA task force regarding NCAA Division II eligibility issues. During his tenure at Mars Hill University, he coached 16 All-Conference players, one All-American, two All-Region players, two SAC Freshmen of the Year, one SAC Player of the Year, and one SAC Male Athlete of the Year. Eleven of his players entered the school’s 1,000-point club. Riggins has the distinction of having three former players who have been inducted into the South Atlantic Conference Hall of Fame. Riggins was inducted into the Mars Hill Athletics Hall of Fame in 2007. Since assuming the role as director of athletics, the Mars Hill athletic complex has seen a face lift. Meares Stadium saw the installation of synthetic turf and the W. Scott Merrill Press Box, along with refurbished seating for the home grandstand and improved visitor seating. Upon completion, the complex was named the Ammons Family Athletic Center and Meares Stadium. It now serves as the home for the football, men’s and women’s lacrosse, and men’s and women’s soccer teams. In addition, a new softball facility was completed on Ponder Field along with the construction of two football practice fields. Belk Field saw the addition of a new practice facility which houses men’s and women’s soccer and lacrosse. That facility was upgraded with a new irrigation system and installation of natural turf. In spring of 2013 the Lions baseball team moved into the newly renovated Henderson Field. The 2012-13 year also saw the addition of a new 2,100-square foot weight room in Chambers Gym. In February of 2019 the Lions will move into the new Jo Ellen Ammons Field House which will be home for football, women’s soccer, tennis, and golf. Riggins played collegiate basketball at Francis Marion University before receiving both his bachelor’s degree (1974) and mas­ter’s degree (1980) from the University of South Carolina. He and his wife, Rita, reside in Weaverville. They have two grown sons, Chase and Kyle.